Decorative Life: Many weeks in flower, longer as a foliage plant. With ‘Dania’, any form and combination of nitrogen fertilizers seems to work equally well in producing high quality and long lasting plants as long as the plants were irrigated frequently and the growing media salts were kept below 1000 ppm using a 1:2 (media:water) by volume salts extraction procedure. However, if allowed to dry too much between irrigations, then lower fertilization regimes produced plants that did better under postharvest interior environments. This species loses about 1.5-2.0 times more water per leaf area compared to many other common foliage plants. This may partially explain why they are often prone to wilt. Member of the Acanthaceae (acanthus family). Native to the Tropical Americas. Some common relatives include Crossandra, black-eyed-Susan (Thunbergia alata) and shrimp-plant. 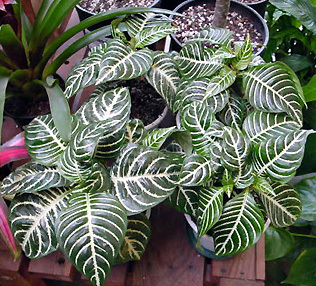 Leaves are glossy green, veins white. Flowers enclosed in showy bracts, forming dense two-ranked spike at stem end. Chill sensitive, store above 55F. Plants can be stored at 77F in the dark for 9 days with no loss in quality under subsequent interior conditions. Plants are easy to grow. Plants should be rested after flowering. Propagated mostly by cuttings and sometimes seeds when available. The specific epithet name squarrosa means spreading or recurved at ends, possibly referring to the often curved leaf margins. Aphelandra: Greek for simple anther, the pollen bearing part of the stamen. Will generally grow well in light levels bright enough to read a newspaper in comfort but higher levels can improve flowering.